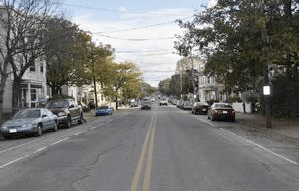 Beacon Street in Somerville, just outside Boston, is perhaps the most biked route in the state of Massachusetts. It also has a terrible safety record. There have been 154 collisions involving cyclists on the corridor between 2002 and 2010, according to the state Department of Transportation [PDF]. Working with officials from the city of Somerville, bike advocates have been promoting a safe solution. And it looks like it’s on the way: The city recently presented preliminary designs that include the addition of a protected bike lane. The Somerville proposal is the latest sign that as protected bike lanes gain currency, this type of street design isn’t just for big city transportation departments. Evanston, Illinois, an inner-ring suburb of Chicago, recently built a protected bike lane linking residential areas to its downtown. As with protected bike lanes in other cities, Boston-area advocates are running up against some opposition in their bid to make Beacon Street safer. The dynamic in this case is a little unusual: A handful of dyed-in-the-wool vehicular cyclists are giving a big assist to residents who value on-street parking in front of their doorstep more than street safety. Somerville’s plan calls for eliminating about 100 on-street parking spots on Beacon for the mile-long stretch where the bike lane will be installed. Although a local parking study found that there was more than enough on-street parking capacity to accommodate the reduction, some local residents have been grumpy about the proposed change. At a recent preliminary design meeting with the community, one neighbor called the plan “discriminatory” (against drivers) and said it violates their “right to park” in front of their homes. “I want my parking place; I think this is a dumb project,” said Somerville resident Marty Filosi. Further complicating the matter is the fact that a handful of vehicular cyclists in the region have opposed the plan. One of them is John Allen, a prominent local follower of John Forester’s transportation theories, which — against the preponderance of evidence — argue that dedicated cycling infrastructure makes cyclists less safe. Vehicular cyclists have long held inordinate sway in the Boston area. For many years, the city’s bike planner subscribed to this philosphy, said Stidman. As a result, Boston had very little dedicated bike infrastructure until recently. Protected bike lanes are a relatively new street treatment for the Boston region, Stidman said, and the lack of familiarity with these designs may be exacerbating the current conflict. There are only a handful of protected bike lanes in the Boston area — two in Cambridge and one in Boston proper. This would be the first one ever constructed in Somerville. Planners hope to complete the project in 2015, but this protected bike lane could be in jeopardy. State Senator Patricia Jehlen — apparently responding to some of the parking gripes — recently spoke out against the protected bike lane. 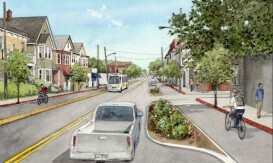 The $5.5 million plan is being led by the city of Somerville and funded by the state. Stidman and other Boston-area bike advocates hope the city will follow through on making the corridor safer for all instead of buckling in the face of irrational complaints. Better keep some of that hyper-alertness for the cyclepath and the intersections they meet. It’s a public way and you’ll be on a vehicle going at least 10mph. Sorry, but the law requires that you operate as a vehicle. You want a limited access roadway? Pay tolls. You want access to a shared public utility? You make compromises to your hassle-free fantasy. “Self-crowned experts”. “Bully”? Quisling”. For those who don’t know that word, Quisling was the Norwegian leader who caved in to the Nazis. A very offensive post, sir, and as to the issue of whether infrastructure is safer — that depends. And as to whether unsafe infrastructure will be swiftly removed and modified, that’s just talking through your hat, isn’t it, especially in connection with projects like Beacon Street, Somervillel, where the proposal is to narrow the roadway, so modification isn’t possible without another complete reconstruction. Say, after 50 years. Infrastructure costs money. Money is tight. We need to look ahead and maintain more flexibility than that. Unless you happen to reach the intersection on the green, in which case nothing you say applies, or just as the light turns red, so you are first in line, you are filtering forward past other traffic waiting to turn until pedestrian traffic clears, etc. Filtering forward past the first vehicle waiting is how to get right-hooked. Thanks. I also note that the alternate proposal for Beacon Street is to widen it slightly to put bike lanes outside the door zone. When cars are moving through an intersection at the same time I get there, I always pass any cars turning right on the left (or I don’t pass them at all if I’m unsure whether they’re turning or going straight). My point though is it’s safer to not have to deal with moving cars at all when passing through an intersection. Filtering forwards past the first vehicle waiting only gets you right-hooked in places where red on right is legal. It isn’t in NYC unless posted. I think that if you actually SAW a grade-separated bicycle facility, you wouldn’t like it. Think of the “elevated subways” in Chicago and Philadelphia. They are ugly. They violate the privacy of people who live in upstairs apartments in the buildings along the street, by putting thousands of eyes right outside those windows. You’ll also find that (a) people don’t like the 20-foot climb to get up to the elevated facility, and (b) people are afraid of crime in such facilities. And then…. there’s the money. Such a facility, at however many millions of dollars per mile, would take money away from other more cost-effective uses of the public’s resources. There may be some places where a grade-separated facility makes sense, but I believe they are very rare. You’re not doing right by the people who were killed by the facility design. That’s an overwhelming factor. Let’s put it this way-given an alternative a doing a single 20 foot climb, then riding 3 or 5 or 20 miles unfettered by stoplights or traffic, versus riding on crowded streets with all the aggravation/danger/dealy that entails, most will choose the former in a heartbeat. In general people prefer totally separate cycle paths over anything else. Unfortunately, some places simply don’t have the space at street level for them, so we need to go above grade, as we did with the elevated subways. An elevated bikeway would be far less intrusive. You could put opaque barriers in areas where privacy in nearby buildings might be a concern. Millions of dollars per mile? I doubt it. Using low-cost, pre-fab structures we could probably do it for a few hundred thousand per mile. Don’t forget on-street lanes start getting costly once you need to add bike traffic signals. Those can run tens of thousands per intersection. And those signals are rarely obeyed anyway if cyclists hit a red every two blocks. As for crime, that’s easy. Any users of the elevated system pay an annual fee (which should partly offset the higher construction costs), and have to pass through a turnstile type gate to enter/exit the system. That should keep out the homeless or criminals. You can also have security cameras recording 24/7 so any perps are quickly identified and caught. Remember besides freedom from congestion, an elevated bikeway can even do fancy things like channel prevailing winds into a tailwind. in a windy place like Chicago or NYC, that could increase travel speeds by 5 to 10 mph. Or put another way, your average cyclist might be able to go 20 mph the entire way, while as fast cyclist could go 25 to 30 mph. Because there is no stopping, average speeds end up pretty close to cruising speeds. If you average, say, 18 mph, you’re running as fast as a local subway train, but without the waiting time. Done right, grade-separated bikeways would revolutionize bike travel in crowded cities. And those crowded cities are exactly where they would make the most sense. And yet. it’s not a fatality statistic. It’s an injury statistic.